China’s Xu Xin, Japan’s Tomokazu Harimoto and Patrick Franziska remain, for Nigeria’s Quadri Aruna and Korea Republic’s Lim Jonghoon it was defeat, as no less than five players who had been required to compete in the two day qualification tournament progressed the quarter-final round of the Men’s Singles event at the Seamaster 2018 ITTF World Tour Platinum Australia Open in Geelong on Friday 27th July. Stars of the show were Japan’s Yuya Oshima and Korea Republic’s Jeoung Youngsik; they were the players to upset the odds. Both qualifiers, Yuya Oshima beat Nigeria’s Quadri Aruna, the no.11 seed (12-10, 11-9, 11-8, 11-4); Jeoung Youngsik, the winner in 2015 when the tournament was staged in Tweed Heads, accounted for colleague, Lim Jonghoon, the no.12 seed (11-3, 11-7, 11-6, 12-10). The results mean that a qualifier is guaranteed a place in the Men’s Singles final; not one seeded player remains in the top half of the draw. Yuya Oshima and Jeoung Youngsik now meet in the round of the last eight, the winner confronts the player who prevails in the all Chinese contest between Liu Dingshuo and Yu Ziyang. In the second round facing fellow qualifiers, Yu Ziyang beat Japan’s Maharu Yoshimura (11-8, 9-11, 11-6, 5-11, 11-7, 11-7); Liu Dingshuo accounted for Chinese Taipei’s 16 year old Lin Yun-Ju (8-11, 9-11, 11-8, 11-9, 11-8, 11-6). Notable success for China, it was the same in the lower half of the draw. Zhou Yu beat fellow qualifier, Sathiyan Gnanasekaran (11-3, 14-12, 12-10, 11-5); Xu Xin prevailed in the one contest in the round where seeds met. The no.2 seed, he overcame Japan’s Jin Ueda, the no.13 seed (7-11, 11-8, 11-3, 7-11, 11-8, 11-1). Meanwhile, not to be upstaged, Patrick Franziska, the no.14 seed, ended the adventures of India’s Sharath Kamal Achanta, he recovered from a two games to nil deficit to record a seven games win (12-14, 9-11, 11-9, 11-3, 7-11, 11-7, 11-8). 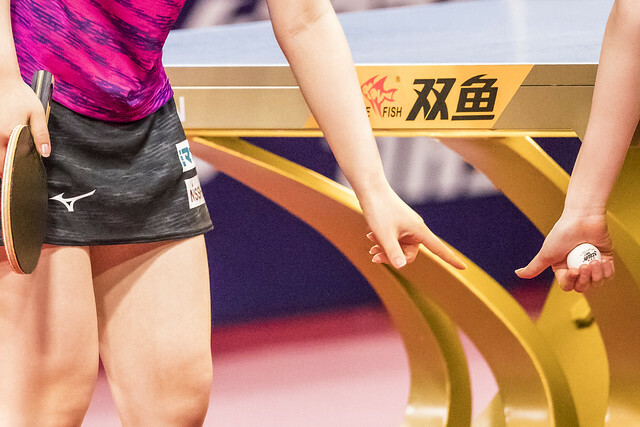 At the quarter-final stage, Xu Xin meets Patrick Franziska, Zhou Yu opposes Tomokazu Harimoto. The quarter and semi-final matches will be played on Saturday 28th July.